Moderately moist to dry. Prairies, upland woodland openings. Full or partial sun. Sandy or gravelly soil. This is a more-or-less erect, perennial forb that rises on a rosette of basal leaves and few to several stems from a perennial base; slender, sometimes thread-like, underground stems (rhizomes); and fibrous roots. The stems erect or ascending, slender to rather stout, much branched, and 2⅜″ to 11¾″ long. They have between 3 and 13 internodes. The distances between the lower stem nodes (internodes) are usually not conspicuously longer than the upper ones. The stems may be entirely hairless or minutely hairy, especially at the nodes. Basal leaves are on leaf stalks (petioles) that are shorter than or rarely longer than the blades. The petioles and blades together are from 3 ⁄16″to 1½″ long and up to ⅜″ wide. The blades are elliptic to inversely lance-shaped. They are narrowly angled or tapered at the base and bluntly pointed or rounded at the tip. The margins are untoothed and flat or slightly rolled under, and may have a minute fringe of hairs visible only with magnification (0.1 to 0.2 mm). The upper surface is hairless or sparsely short-hairy. The lower surface is hairless. Stem leaves are unstalked or short-stalked, linear to narrowly oblong, no more than ¼″ wide, and bluntly pointed at the tip. They are otherwise similar to basal leaves. They have a single midvein and no visible lateral veins, even on the wider leaves. At the base of each leaf there is a triangular to egg-shaped, about ⅛″ long, leaf-like structure (stipule). The inflorescence is one to several flat clusters of 2 to 7 flowers at the end of the stem and sometimes also from the upper leaf axils. Each flower is on a 1 ⁄16″ to 5 ⁄16″long stalk (pedicel). 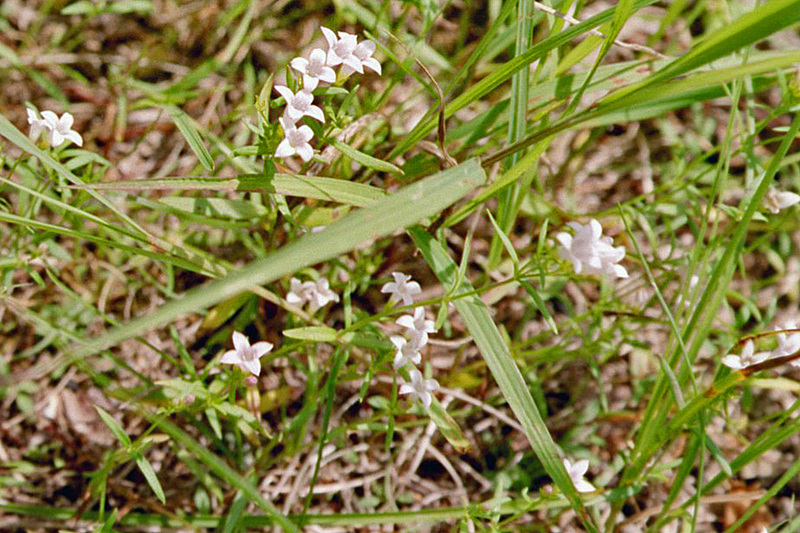 The flowers are funnel-shaped and about ¼″ across. They have 4 sepals, 4 petals, 4 stamens, and 1 style with 2 stigmas. The sepals are green and are united into a calyx tube with 4 spreading, narrowly triangular, 1 ⁄32″ to ⅛″ long lobes. They are no more than ½ as long as the corolla tube. The petals are united at the base into a ⅛″ to 3 ⁄16″ long corolla tube then separated into 4 spreading, triangular, 1 ⁄16″ to ⅛″ long lobes. They are white to purple or pinkish-purple, or sometimes bluish. They do not have a yellow or reddish ring of at the top of the throat. They are hairless outside, hairy in the tube and on the inner (top) surface of the lobes. In a strategy to promote cross-pollination, two types of flowers are produced, known as pin and thrum flowers. They are identical except for the placement and length of the stamens and styles. Pin flowers have the anthers within the corolla tube and the style projecting beyond the throat. Thrum flowers have the style within the corolla tube and the anthers at the throat or projecting just beyond it. The fruit is 2-lobed capsule with several seeds. The capsule is globe-shaped to egg-shaped, 1 ⁄16″ to ⅛″ long, and 1 ⁄16″ to ⅛″ wide. It is not flattened or is only slightly flattened. When ripe, it splits longitudinally from the tip, dispersing the seeds. 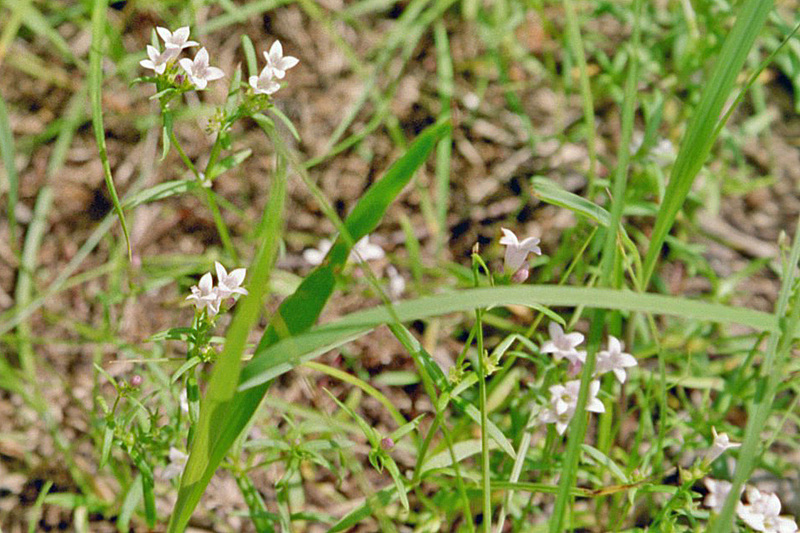 Plants in the genus Houstonia were formerly placed in the genus Hedyotis. The latter was a “dust-bin” genus, containing many distinct groups of species that did not fit comfortably into other defined genera. 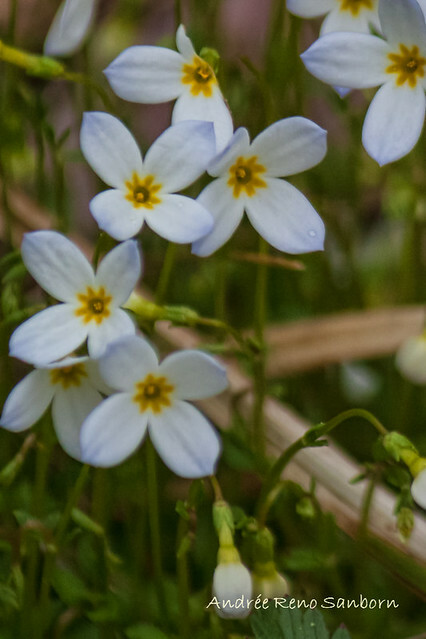 The segregated genus Houstonia contains 20 species native to North America with seeds having ventral cavities or depressions (crateriform); having chromosome numbers of 6, 7, 8, and 11; and by pollen type. Some authors recognize two varieties, var. longifolia and var. tenuifolia, based on the length of the pedicels and the width of the leaves. A recent analysis of the species across its entire range (Terrell, 1996) does not support the split. When plants first begin to flower the pedicels are short, but they expand as the flowering continues. The portion of a stem between nodes.